Primary and incisional hernia can be repaired by multitrocar laparoscopy. Single-access laparoscopy (SAL) recently gained interest to decrease the invasiveness and to reduce the abdominal trauma, besides improved cosmetic results. The authors report first 50 patients who consulted for primary and incisional hernia and treated by SAL prosthetic repair. Between December 2009 and March 2012, 50 patients (24 females, 26 males) were submitted to SAL for primary (23) and incisional hernia (27). Mean age was 49.1 ± 15.1 years (17–75), and mean body mass index 29.7 ± 5.7 kg/m2 (19–44.1). A total of 26 primary and 30 incisional hernias were treated. The technique consisted in implied the use of an 11-mm trocar for 10-mm scope, curved reusable instruments without trocars, and dualface prosthesis fixed by tacks without transfascial closures. No conversion to open surgery nor addition of one or more trocars was necessary. 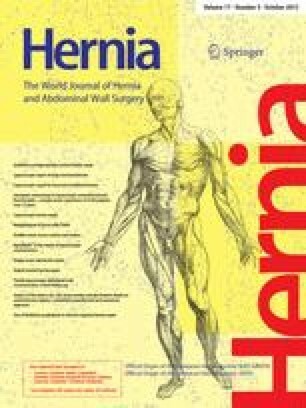 Mean perioperative hernia sizes were 7.0 ± 5.0 cm (2–24) in length and 6.0 ± 3.4 cm (1–16) in width, for a surface of 55.0 ± 64.6 cm2 (2.8–268.2). Mean prosthesis size used was 188.1 ± 113.4 cm2 (56.2–505.6). Mean laparoscopic time was 60.2 ± 32.8 min (26–153), and mean final scar length was 21.2 ± 4.5 mm (13–35). Mean hospital stay was 2.2 ± 1.2 days (1–8). Perioperative complications were registered in 4 patients and minor early complications in 13 patients of each group. After a mean follow-up of 16.1 ± 8.8 months (4–34), 2 late complications were observed in one patient of each group. Primary and incisional hernia can safely be treated by SAL prosthetic repair, but a learning curve is unavoidable. Thanks to this approach, in patients with primary hernia, only a small scar is finally visible, and in patients who proved to be prone to develop incisional hernia, the number of fascial incisions can be reduced. This paper was presented in part as oral presentation at the 5th International Hernia Congress The World Hernia Celebration, jointly sponsored by the American Hernia Society and the European Hernia Society, New York (NY), March 28–31, 2012. The first author is consultant for Karl Storz-Endoskope, Tuttlingen, Germany. The other authors have no commercial associations that might be a conflict of interest in relation to this article.